Extreme tornadoes in the United States over Christmas, abnormal snowfalls in Mexico, and heavy flooding in South America and the United Kingdom. Perhaps the strangest weather took place in the Northeast, where along the Eastern Seaboard summer-like temperatures made for a green Christmas. It was the warmest Christmas Eve in the history of New York City, where residents and tourists alike strolled the streets in shorts and T-shirts as temperatures hit 72 degrees. It reached 71 degrees in both Philadelphia and Washington, D.C., while normally icy Boston saw the mercury hit 68 degrees. As unseasonably warm temperatures blanketed the Northeast, Southern Californians prepared for snow and ice, and deadly tornadoes swept through the South, claiming at least 20 lives, making for an atypical Christmas Eve in many parts of the United States. 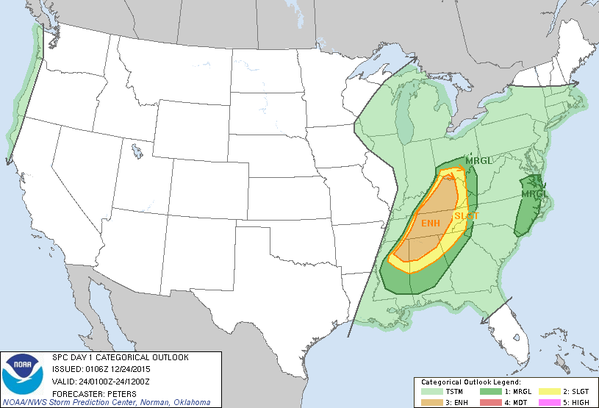 Twisters that dotted the landscape from Michigan to Arkansas, along with torrential rains and strong winds. Roads were flooded in Georgia, while other states like Alabama experienced mudslides. Mississippi was hit particularly hard by tornadoes. The death toll in Mississippi, Tennessee, Arkansas and other Southern states had reached 20. Many others were injured, and dozens of homes were damaged or destroyed. Tornado weather is typical in the spring, but can happen anytime cold air meets hot air. The above-average temperatures seen early this winter were attributed to El Niño, a heating of surface waters in the Pacific Ocean associated with warmer and drier weather. The El Niño currently wreaking havoc around the world is forecast to only worsen in 2016 — and NASA experts fear it could get as bad as the most destructive El Niño ever. A new satellite image of the weather system "bears a striking resemblance to one from December 1997" — the worst El Niño on record — which was blamed for extreme weather, including record rainfall in California and Peru, heat waves across Australia, and fires in Indonesia. The severe conditions resulted in an estimated 23,000 deaths in 1997 and 1998. This year's El Niño has already caused wild conditions for much of the United States. : It contributed to the reasons why many Americans experienced a balmy Christmas Eve, with temperature peaking in the 70s in places along the East Coast, and is responsible for deadly storms and near-record flooding in the South and Midwest. It also has been tied to the worst floods in five decades in South America. But a Dec. 27 satellite image from NASA's Jet Propulsion Laboratory, which measures sea surface heights, implies the worst of the droughts and flooding are still to come — a forecast that is troubling to humanitarian relief agencies. In Ethiopia, for example, the government estimates 10.2 million people will need humanitarian assistance next year due to a drought exacerbated by El Niño, Oxfam said. In Malawi, 2.8 million people are estimated to experience food shortages before March. 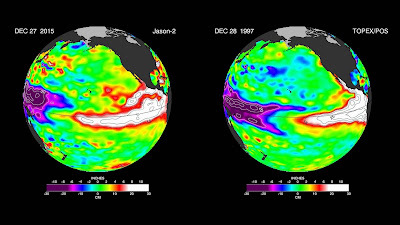 In the U.S., the biggest El Niño impacts are expected in early 2016, NASA said. The National Oceanic and Atmospheric Administration forecasts "several months of relatively cool and wet conditions across the southern United States, and relatively warm and dry conditions over the northern United States," NASA said. tornadoes and storms killed more than 20 people in the US states of New Mexico, Texas, Oklahoma, Missouri and Illinois, and flattened hundreds of buildings and houses. Meanwhile, the intense floods in South America are considered the worst in the past 10 years, forcing more than 170,000 people to evacuate in Paraguay, Argentina, Brazil and Uruguay. 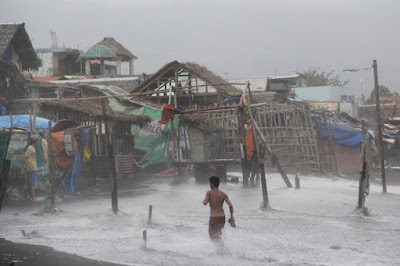 “The abnormal flooding is consistent with the prediction made by the World Meteorological Organization (WMO) last November. We cannot ignore science.” Last month, WMO warned that the majority of international climate outlook models indicated that the 2015-16 El Niño weather phenomenon was set to strengthen before the end of the year, causing more flooding and more droughts, setting it among the three strongest since 1950. The phenomenon, characterized by a warming of the Pacific Ocean, is also triggering a rise in drought in different parts of the Americas, sparking the worst droughts in decades in Central America and Haiti, and that they will continue into 2016. In Mexico, snowfall over the weekend blanketed 32 towns in the state of Chihuahua, with some places hit by accumulations of 30 centimetres and temperatures of -18 degrees Celsius. December has seen communities in Cumbria, Lancashire, Greater Manchester and Yorkshire in the UK swamped by rising waters with damages that could exceed £1.5 billion. “The repetitive floods in the UK and unusual snowstorms in Mexico are alerting the world about how difficult it is to predict global warming impacts and climate change,” Ms. Wahlström said. Matt Sitkowski, a coordinating weather producer at The Weather Channel, told NBC News that El Niño could result in a "wetter and stormier California" for the next two to three months — which could be a boon for the drought-stricken state. "The fear is some of these storms come and you get too much at once, which could lead to flooding concerns," he added. "It doesn't take much in parts of California." "The El Niño weather system could leave tens of millions of people facing hunger, water shortages and disease next year if early action isn't taken to prepare vulnerable people from its effects," aid agency Oxfam International warned in a press release. Meanwhile, holiday travelers in Southern California prepared for a cold system Thursday that was expected to bring rain, cold and snow in mountainous areas. Portions of Interstate 5, the main highway on the West Coast, were to become blanketed with snow and ice. Forecasters also were expecting wind gusts of up to 45 mph.